The Air Force Manned Orbiting Laboratory (MOL) was a 1960's Cold War space station. It was designed to keep tabs on enemies, among other duties, but received the budget ax partly due to rising costs. Image courtesy www.deepcold.com. A recent ventureinto a long-locked room at Cape Canaveral Air Force Station in Florida uncoveredartifacts of a by-gone era: spacesuits for Americans who trained in the 1960sto be space spies, reports NASA on its website. Two securityofficers were doing a check of the Launch Complex 5/6 museum, the formerblockhouse from where the first American manned space flight was controlled.NASA Special Agent Dann E. Oakland and Henry Butler,Security Manager for Delaware North Parksand Resorts, discovered a locked room -- and they did not have a key. Using a master keyfor the facility, the locked door was eventually opened. With no power, theroom had evidently not been in use by people in many years. The officers usedflashlights to explore the room and make their find. Oakland and Butler weren't the firstvisitors. "During theturn over [from NASA to Delaware North] of the facility, the NASA/CCAFS FireDepartment briefly accessed that room and discovered many, many reels of deterioratedfilm. The film had deteriorated so much that it was deemed a fire hazardconcern," explainedOakland inresponse to an e-mail sent by collectSPACE. Besides the film, Oakland and Butlerfound the two blue spacesuits "complete and in remarkable shape," asthey were described by the suits' manufacturer who examined them. "The suitswere stored in their original shipping container with extra sets of gloves ofvarious sizes," described Oakland. "The inside of the container's lid had the holder for the flight datafiles and a hand painted NASA logo." "My firstthoughts were to safeguard the suits to protect them from being destroyed orstolen," Oakland wrote. Investigatorsbegan looking for who owned the suits. A NASA technician initially thought theywere training units from the end of the two-man spacecraft Gemini Program orbeginning of the Apollo lunar program. 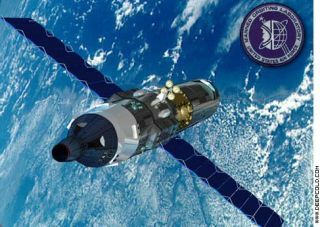 The manufacturer,however, determined that they were MH-7 training suits from a short-lived ColdWar-era military program to put a manned reconnaissance station in space. Established in1964, the Manned Orbiting Laboratory (MOL) was an Air Force initiative that would have sent USAF-selected and trained astronauts to amilitary- contracted space station in a modified Gemini capsule. After a fewweeks in orbit, the crew would undock and return to Earth. The Air Forceabandoned the program in 1969, but not before three groups of military officershad trained to be astronauts. Of the twospacesuits, one labeled as number 008 had the name "LAWYER" on itsleft sleeve; Lt. Col. Richard Lawyer was a member of the first group recruitedto be MOL astronauts in 1965. Records show thatNASA transferred ownership of Lawyer's suit to the Smithsonian Institution in1983. It has now been returned to the Smithsonian. No records werefound for the other suit, identified with the spy- appropriate number 007. Itstill belongs to NASA, and the agency's plans for what to do with the spacesuitare still being determined. "I would liketo see suit 007 displayed at the Astronaut Hall of Fame in their Gemini displaytelling the story of the Manned Orbiting Laboratory program," wroteOakland. Other items ofhistorical note were found in the room. "Also in theroom was a Space Shuttle main landing gear flown tire, miscellaneous launch padelectrical equipment from complex 5/6 and the film canisters mentioned,"said Oakland. The MOL programleft other legacies to NASA, as well. When the program was canceled, seven ofthe younger astronauts were transferred to the agency's human space flightprogram and went on to have standout careers. Among them were Robert Crippen, pilot of the first Space Shuttle mission, andRichard Truly, who later served as NASA Administrator.